The Bantou Zone is located on the Houndé Greenstone Belt, approximately 170 south of Mana in the south-west of Burkina Faso. 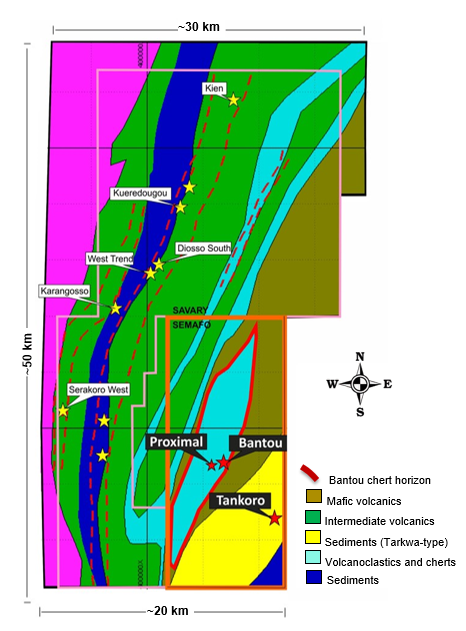 Bantou hosts a maiden inferred mineral resource estimate of 2.1Mt at 5.35 g/t Au for 361,288 oz. Bantou is located contiguous to Savary Gold Corp’s (“Savary”) Karankasso project, which has inferred mineral resources of 12.3Mt at 2.03 g/t Au for 805,000 ounces. In March 2019, SEMAFO and Savary Gold Corp. announced that they had entered into a definitive combination agreement pursuant to which SEMAFO will acquire all of the issued and outstanding common shares of Savary not already owned. SEMAFO owns 15.5% of Savary’s issued and outstanding shares on a non-diluted basis.